If you use the Nikon V1 with the GP-N100 GPS unit, you should update the GPS firmware to version 1.10, which fixes an issue where the clock might be set wrong if you're using the Set Clock Automatically from GPS option. This update is handled a bit differently than the camera firmware updates, so be sure to read the instructions on Nikon's site about using the GP-N100 Utility. 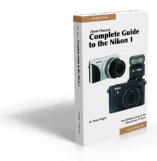 As I write this, the update is not yet on the NikonUSA site, but it appears to be on the various other Nikon subsidiary sites around the world.